NextGen Genealogy: The DNA Connection to Printer? What's Next for Dr. D? This allows me to see "Longest Block" and other items of interest. I then located the person with whom I shared the longest block but had yet to find a relationship on paper. That person shares a block of 41 cMs with me on Chromosome 10 and is predicted by FTDNA to be my 2nd to 4th cousin. I then looked for others who matched the two of us. There were several who overlap part or all of this 41 cM area of Chromosome 10. Ten others overlap that shared block in amounts varying from 9.9 cMs to 29 cMs. The various relationships and common ancestors shared among the individuals in this cluster will take some time for us to try to sort out. All of these individuals are on my dad's side of the family. In addition to matching me, they also match my paternal first cousin. Also four of them (including the one with the 41 cM match) match each of the others. All of them match at least five others in this group. Not all apparent matches are real. But wait. Let's not get ahead of ourselves. It is easy to get hypnotized by the statistical precision of DNA lab reports. DNA doesn't lie and lab errors are rare. However, we must be careful to interpret the results correctly. My first clue that something was amiss was when I loaded these individuals into Family Finder's Matrix tool. The individual represented by the orange bar in the Chromosome Browser view of Chromosome 10 above matched me, my paternal first cousin, and seven of the others when I compared them in the Matrix tool. The apparently identical blue bar represented an individual who only matched me. Later I discovered that this second individual also matched my maternal first cousin. In other words the first (orange) matched a segment of DNA that I had inherited from my father. The second (blue) matched a segment of identical length and location that I had inherited from my mother. That double helix must be respected. The two apparent exact and identical matches with me turned out not to be matches with each other. A few thousand if not several thousand men have or soon will have BIG Y test results. Of these the R1b-L21 haplogroup project has 800 all by itself. Funding the test is only the first major hurdle. Next comes the formidable task of incorporating the information into your family history. Making sense of all the SNPs that have been discovered in the last year is overwhelming to many of us. That SNP Tsunami wave train is not a single event but a series that will be washing newly discovered SNPs ashore for the foreseeable future as more men are tested. Hopefully you will have some SNP Superheroes in your haplogroup like the ones from whom I have benefited in L21. Without their mentoring I would still be struggling to stay afloat and would have very little understanding of the information newly liberated from my yDNA. "Big Y results are like slices of Swiss Cheese - full of holes and inconsistencies. It is only by putting together all of the slices that you get the full picture." The data in the various columns in my report above are examples of Ray's slices of Swiss Cheese. As is typical of the BIG Y reports I have seen, the men in this listing share about twenty-five thousand SNPs (right column). That is interesting but so far I've not found that particularly relevant to my research. However, the order of the matches is relevant. You will note that they are ranked by the values in the Known SNP Difference column. Based on this column one could assume that the man listed first is my closest genealogical match. Not so. He is my second closest match in this group. My closest genealogical match is the 6th man listed. He is a known 6th cousin--once removed. Remember Ray's Swiss Cheese! When a much more comprehensive amount of the evidence from my BIG Y results was analyzed by SNP Superhero Alex Williamson, he appears to have arrived at the correct conclusion about our relative relationships and arranged our SNP branching in the correct sequence. Alex is the creator of The Big Tree of BIG Y results for those of us who have tested positive for R-P312 -- a parent SNP of L21. He found 5 SNPs that I shared with my known cousin after we parted company with the man listed at the top of my list above. The three of us share about twenty BIG Y novel SNPs that have not yet been found in other BIG Y results. We are hopeful that this situation will branch further when the results of three other men, thought to be somewhat distantly related, are posted in February. Most of us, including Dr. D, have not begun to master the wizardry demonstrated on our behalf daily by Alex, Ray, Mike Walsh and many of their associates. However, I would like to share one trick that even novices can feel free to try at home as long as you remember the "Swiss Cheese" caveat. Next open the drop down menu under Shared Novel Variants. In the example below I have scrolled down the list until I came to the point where the matches start narrowing down from a few hundred to a few. The long series of numbers indicate the location on the Y chromosome where that particular SNP is located -- in this case 19201991. This just happens to be the location of the SNP that defines my subclade S1026. Note that 12 other men have tested positive for this SNP and are also members of this subclade. Slide the scroll bar to the bottom of the list in order to find those likely to be your closest cousins. In the example above the SNPs followed by "(2)" will show two other men if the entire screen were displayed. For privacy reasons I have not shown their names or the buttons to display their email addresses. If you move the slider scroll bar completely to the bottom of the list, you may have a single individual who should be your closest match. However, remember Ray's Swiss Cheese! Occasionally, you may have a SNP that is totally at random or appear to be that may match with one or a few men in some totally separate and distinct haplogroup. That is when you need to combine several slices of cheese to get the full picture. If you do look at a half dozen or more SNPs a true pattern should emerge. Happy snipping! It think I'll go make a grilled cheese sandwich -- Swiss of course. Many of us wonder what path our ancestors traveled through prehistory to the time that pieces of their journey were recorded in various forms of the written word. Those of us who have European female ancestry can use a full mitochondrial test to tell us from which of the Seven Daughters of Eve we descended through our direct maternal lines. However, we must not lose sight of the fact that we may have descended from several of the seven daughters described by Bryan Sykes or even from sisters of the Eve hypothesized in his book. For example my maternal grandmother in a direct umbilical line descended from Helena but my paternal grandmother descended in a parallel line from Ursula. My daughter and son descended from Helena by a very different "umbilical cord" line. Through my daughter-in-law my Dowell grandchildren picked up a second line from Ursula and a line from Katrine through their maternal grandfather. Connecting these ancient SNP defined lines with our documented genealogies has been more problematic. Some of us have been able to make haplogroup connections that are meaningful to our genealogical research; but most of us have not. Full mitochondrial databases are still very small compared to both yDNA and atDNA databases so matches are not as common. Also, as I discussed in Part 1 of this series, the amount of information recorded in your mitochondria is minuscule compared to that contained in your chromosomes. Much of the information that is reported to those of us who have taken the BIG Y test is unintelligible to most of us -- at least at first. FTDNA does not report our BIG Y results in the yDNA section of our My DNA page. Rather, it is in the Other Results section. This is the first indicator that BIG Y results have not yet been integrated with the rest of your yDNA reports. This is most important to remember when you try to understand the place of your own SNPs within the FTDNA. No SNPs have been added to the Y-DNA Haplotree since the inception of BIG Y testing a year ago. Only SNPs that had been discovered by FTDNA or GENO2 prior to November, 2013 are included in the FTDNA's current tree. Even some of the SNPs for which you may have confirmed results from individual tests at FTDNA are not reflected on their current tree. These also may not be included in their listing of your confirmed results on your opening my DNA page. For example in 2012 I took an individual SNP test at FTDNA for a SNP named DF13 and was found to be positive. DF13 was then and is now known to be below L21. However, I am still being shown to have a terminal SNP of L21 on my FTDNA report. More recently BIG Y has discovered about thirty more SNPs below DF13. 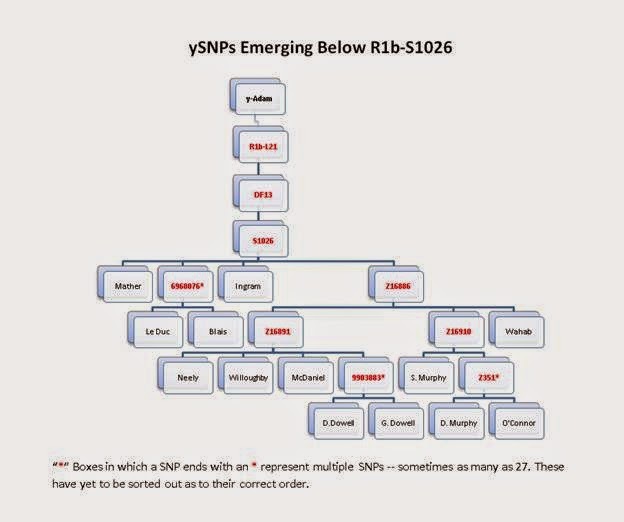 There is no way FTDNA could have included those thirty SNP in their tree yet. This is a different kind of exploration. The BIG Y is a voyage into the unknown inner space of our yDNA. However, DF13 was known and I had been tested for it more than a year before BIG Y blasted off and more than a year before the last update of FTDNA's current tree. This is not a criticism of FTDNA's tree as much as it is a caveat warning you not to read too much into it. Probably less that one-tenth of the SNPs on our Y chromosomes, about which we know today, were known at the time FTDNA was putting the current table together. It is going to be a monumental effort to update it. I think I'll stop now before continuing soon with some hints on how you can begin to interpret your BIG Y results. That is really what I started to do in Part 1 before I decided I needed to give some background first. The more I learn about the publishing industry, the more confused I get. 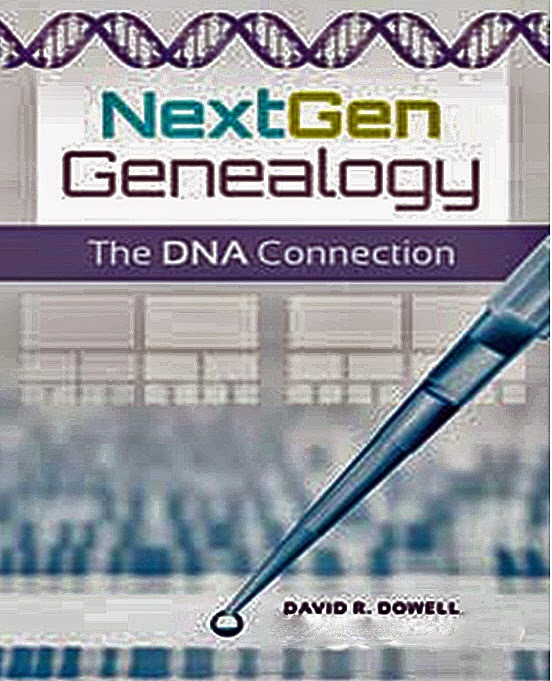 As some of you know the official release date for my new book, NextGen Genealogy: The DNA Connection, was November 30th. If you pre-ordered it from the publisher ABC-Clio, you probably already have the physical version in hand. Amazon started allowing Kindle downloads last Sunday, but as of this morning does not yet have the paper copy in stock. Barnes and Noble has been offering the Nook version all week. Next comes the matter of price. On the publisher's site the price has consistently been $40 for the physical book. If readers email me, InfoDoc [AT] ddowell.com, I can send you a discount code from the publisher that will give you a 20% discount. That will make the price $32 before shipping. Amazon originally offered the paper copy for $40 but has recently lowered that to $38. With Amazon's pre-order guarantee, any of you who have placed orders there should get it at that price and you may get free shipping if you have a Prime account. Over on the e-book side, Amazon has been offering the Kindle version for $35.99. Barnes & Noble started out offering the Nook version for about $23 but quickly changed its price to the current $30. Although the publisher also offers an e-book version, you probably should not be interested unless you are a library that plans to offer the book to your patrons from your own server. Then comes the description of the book. Some of you may know that the information about books that you see online generally was created before the book was written. It was created by the publisher soon after the contract was signed. In the current example, all three online sources mistakenly agree that the book has 136 pages. The actual physical book I have in hand has 173 pages including the index. The lower number was the publisher's guess to use a place holder before the manuscript was received. Such information takes on a life of its own. Another example of information taking on a life of its own is the co-authorship of CeCe Moore. CeCe was originally contracted to participate in this book project. Based on that the publisher originally created a cover that included her name. Initial information including her name was included in the publisher's catalogs and was sent to others including Amazon and Barnes & Noble. Then CeCe's career as a DNA consultant for television programs and her independent consulting work rocketed at a pace that forced her to withdraw from this book project at a very early stage. A new version of the cover was created and the publisher no longer mentions her on its site. I was able to get Amazon to remove reference to her authorship. However, the Kindle division appears to operate in a different universe than does the print division of Amazon. The short version of this saga is that you will still see CeCe mentioned by Kindle and Nook. Thank you for indulging me in this rant. Perhaps this will make you a more informed consumer as you contemplate purchasing this and other books. FTDNA sure came up with a way to entertain for the next 5 weeks those of us who are DNA junkies. 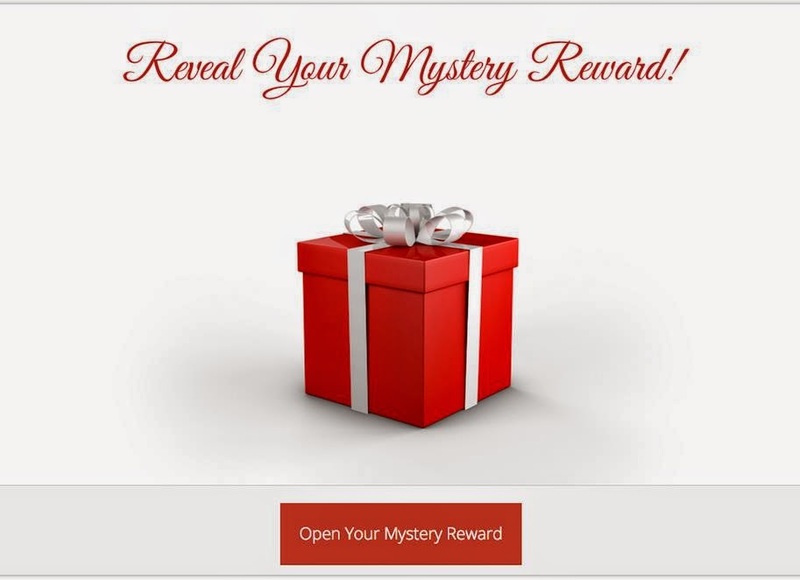 The introduction of the Mystery Reward to the sale is a game changer. If gives us a chance to open our presents (Mystery Reward) discount codes before Christmas -- actually every week. Now the tactical planning can begin. 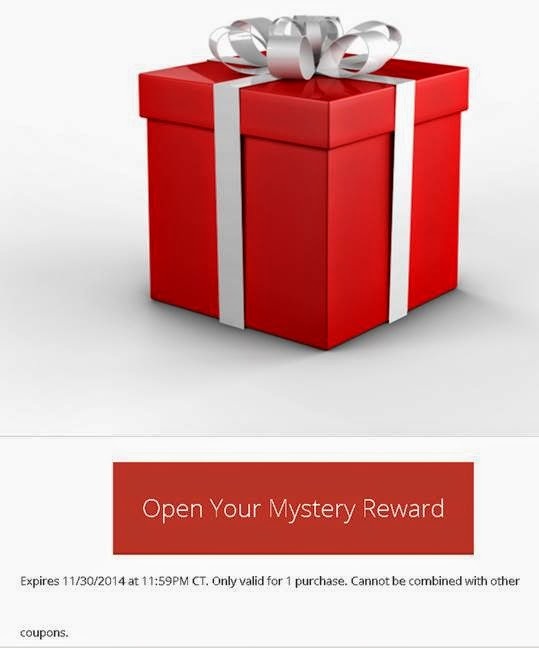 The currently available Mystery Rewards expire Sunday night. Apparently they come in 11 categories as Angela Robertson reported on the ISOGG Facebook site: "There are supposed to be 11 kinds of coupon codes. I have identified 10 of those 11 so far. (I don't have all these, but have been tabulating from posts I've seen.) Anyone know which one is missing?" Now the tactics for a winning holiday genetic genealogy season quickly are coming to the fore. Since you will be offered a new Mystery Reward each week until the end of December, should you wait and hope for a "better" discount? Should you use the discount code you have before it expires on Sunday night? Should you give it to a family member or friend? 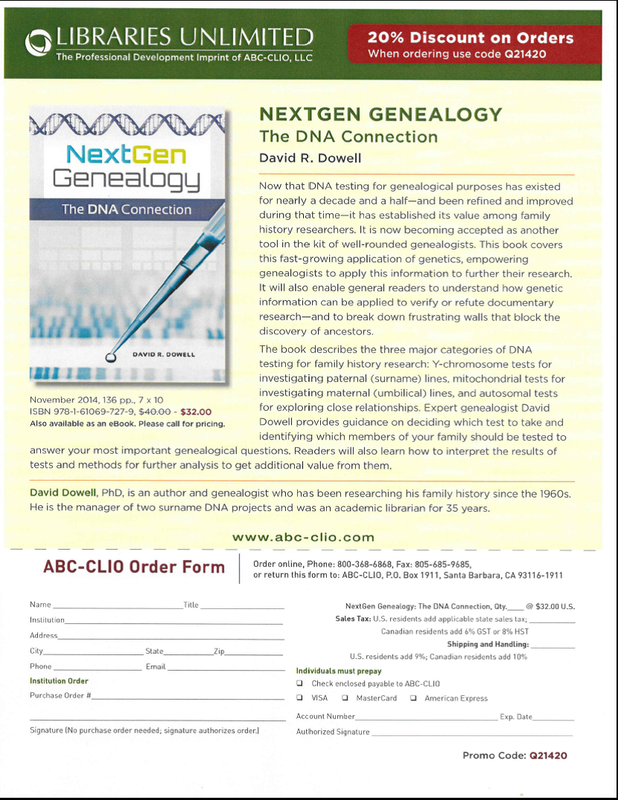 Should you offer it to a fellow genetic genealogist? The codes are transferable but have a limited life. A secondary marked has already erupted on Facebook. If your Mystery Reward is not showing up on your MyFTDNA page you probably need to clear the cache of your browser and try again. That worked for me. YSeq has also announced that all its extensive catalog of tests for individual yDNA SNPs are on sale for $19 per test. This sale is scheduled to end on December 3rd. Join in the fun. No Black Friday sale has excited me like this in years. ​ We’re launching the long-awaited Holiday Sale and we wanted you to be the first to know! It will extend through Dec. 31, 2014 (11:59 PM Central). The reduced prices will either be visible at 10:00 AM Central or very shortly afterwards. 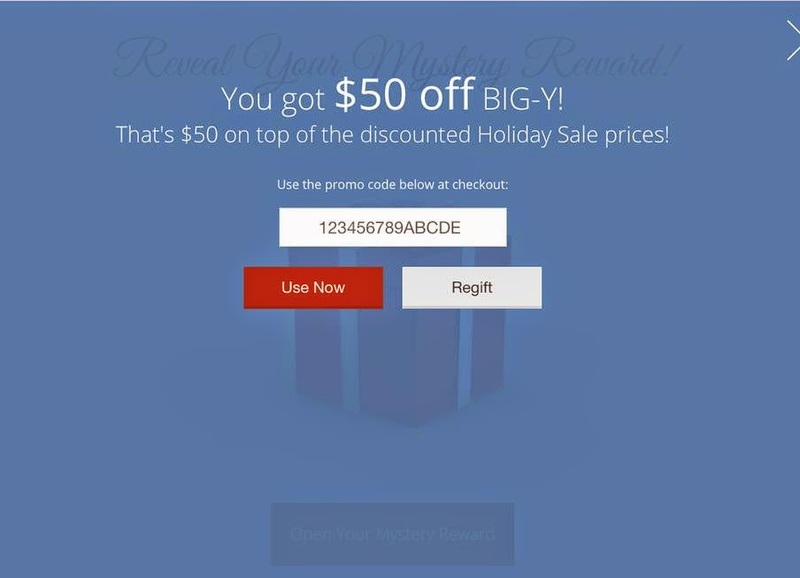 For this holiday season we’ve got an exciting new twist to the sale - Mystery Reward discounts! The Mystery Reward will be a randomized discount (up to $100 off) that can be applied on top of the already reduced Holiday Sale prices. The Mystery Reward icon will appear on testers’ myFTDNA dashboard each week and the code will expire the night before the next Mystery Reward appears. When you click the icon, you'll to go to the reward page to open the Mystery Reward for savings up to $100. We’ll also send an email notification to the kit’s primary email address when a new code is available for use or sharing. 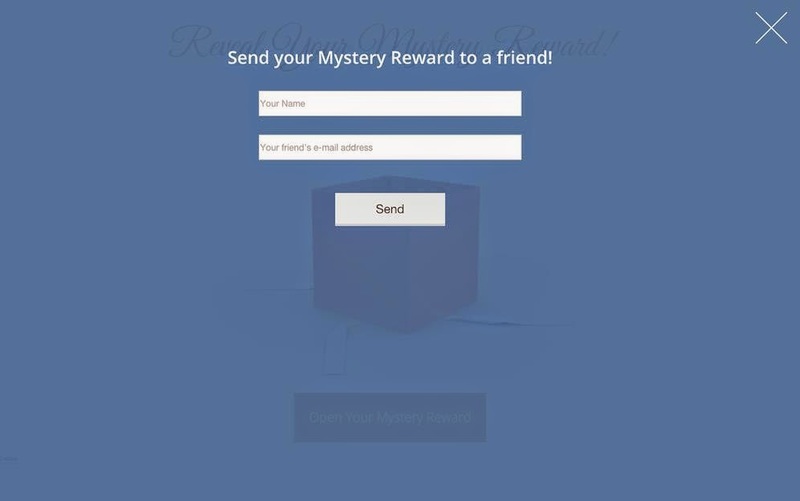 Best of all, there will be a new Mystery Reward every week. Customers can use the discount or can share it with a friend. In addition, all customers who have purchased the Big Y test will receive a coupon for $50 off a Big Y test. That's ON TOP of the sale price. Yes, you read that right. A coupon that can be used on top of a sale price. The coupon can also be "regifted," meaning shared with a friend or fellow project member. Dr. D wonders if 23andMe and Ancestry will follow with offers of their own? They are really only in competition on FTDNA's Family Finder test. Neither 23andMe or Ancestry offer yDNA or mtDNA testing. Rumor has it that Ancestry may offer something on Black Friday. Most of us, who have been interested in genetic genealogy for more than 4 years, got our start by trying to understand the STRs (Short Tandem Repeats) of yDNA. For those of you who are new to this field, STRs are what is counted at various specified locations along Chromosome Y to generate the numbers on 12 markers, 25 markers, ... and 111 markers test results. In the last few years our attention has been drawn to the cMs (centiMorgans) of matching segments of the large numbers of atDNA kits that have been tested by 23andMe, FTDNA and Ancestry. Unfortunately, Full Mitochondrial Sequence test results have yet to reach the critical mass necessary to make mtDNA genealogically relevant to many of us. As the number of individuals tested continues to grow, this test will have genealogical relevance for more of us. In 2014 the first wave of the SNP Tsunami engulfed us as results from Full Y, BIG Y and Chromo2, among others, began to come back in greatly increasing numbers. The mechanisms for organizing the newly discovered SNPs (pronounced "snips") could not begin to keep up. The FTDNA SNP tree currently lists my most recent SNP as R1b-L21 even though I had tested positive for DF13 (the next level down) in their lab in June, 2012. DF13 does not yet show up of FTDNA's SNP Tree even though several hundred customers have tested positive for it. Only SNPs known by November, 2013 and mostly those on the chip of National Geographic's Geno 2.0 test have so far been incorporated. As a result none of the SNPs discovered in the last year are listed in Y-DNA Haplotree currently posted on FTDNA's website. 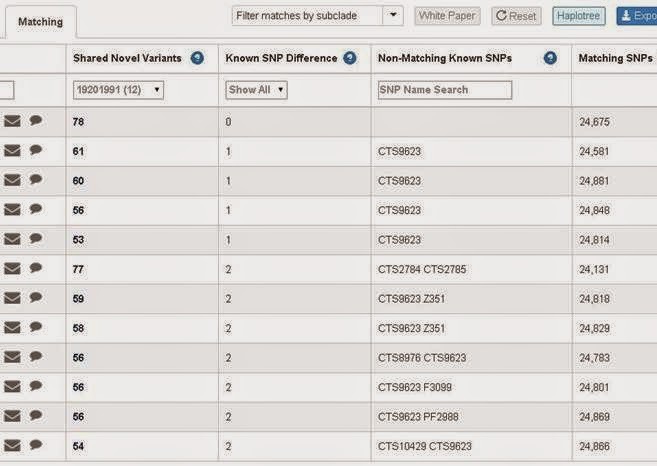 Your S1026 subtype was recently discovered using Chromo2, so its distribution is not yet understood. You may carry markers that further define your subtype, but do not yet appear on our tree. You will find these in your genetic signature. The ISOGG yTree is trying to keep up but is woefully behind where the SNPs are daily being identified as they wash ashore in the haplogroup discover projects. This tree which is relied on by academics and hobbyists alike to document the descent of "man" from yAdam to the present had identified and placed on its tree a total of 3,610 SNPs from 2006 to about this time last year. Since January of 2014 alone more than 10,000 additional SNPs have been added. And there is no end in sight. Tens of thousands more are in the process of being identified and placed by citizen scientists. NextGen sequencing has identified them. The harder job is to assign each of them to the correct haplogroup and to arrange them in the correct chronological order. Many more men need to be tested before this process can near completion. Men wishing to learn more about their deep ancestry and those who wish to build bridges from their deep ancestry to their ancestral trail into genealogical time cannot rely on the yTrees of either FTDNA tree or ISOGG. These are too far behind the trail blazers. Instead the strategy that seems to be working is to seek out a man who has already taken a NextGen test AND who shows up as a match for them on a ySTR test. A match within 10 markers on a 111 marker ySTR test is likely to be a fellow member of one's subclade just beyond genealogical time. Mismatches of 7 or less on a 67 ySTR test are also good candidates. SNP R1b-S1026 was discovered just below L21 and DF13 by ScotlandsDNA's Chromo2 service shortly before the BIG Y results started coming back. It is at the very bottom and slightly right of center in the diagram above. At the moment it is represented by 4 pale rose colored boxes. This is my subclade. We are attempting to expand this group down into genealogical times and we are getting close. Recently two men who previously had not SNP tested were tested for newly discovered Z16891. For those of you who are trying to keep score, Z16891 is the rightmost pale rose SNP on the very bottom row in Mike Walsh's excellent chart above. These men were single SNP tested using the older Sanger technology at FTDNA. ySeq also offers the same test. These men chose to be tested for Z16891 because they had close STR matches with men who had taken part in the discovery of Z16891 as part of BIG Y. In both cases the men tested positive. These positive tests allowed these two fellow travelers to document their journey down the SNP flow from yAdam to SNP Z16891. This process provided a very inexpensive option compared to the first class ticket for the BIG Y. It is also less helpful to the discovery process. These men also did not get a list of SNPs below Z16891 that could turn out to be terminal SNPs that uniquely identify their specific families. It is hoped that the testing panels now being developed will be another avenue for more men to get involved in SNP testing -- something between the vast BIG Y and the narrowly focused individual SNP tests. If those come on line over the next few months, we then will be looking at ways to test potentially terminal SNPs for individual families that may become the 21st century equivalent of 17th century coats of arms. According to the schedule established by the publisher last summer, NextGen Genealogy: The DNA Connection should have gone to the publisher yesterday. Did it? Only time will tell. As some of you may have heard me say, I was born in Missouri, the "Show Me" state. Therefore, I only believe things after I have seen them. Since I am a slow learner, I often don't believe them until two weeks after I have seen them. The official publication date for the book is November 30th, 2014. That hurdle should easily be met. The project was on schedule when I submitted the corrected page proofs and the index on September 25th. Since then it has been totally out of my hands. If any of you are interested in getting copies, they are available through the publisher, Amazon and other outlets. This post is taking far longer than I had intended. As I went through the process of writing and creating links. I found many distractions. My original intent was to warn potential buyers of two possibly misleading bits of information in the advanced publicity. CeCe Moore was originally contracted to be a writing partner for this book. The book would have been better if she had been able to participate. However, her commitments to other projects did not allow her to meet our publication deadline. You occasionally will see her name associated with the book. I don't want you to buy the book under false pretenses. Once a book project is underway, it is like trying to get an aircraft carrier to change course to get all the databases corrected to reflect mid-project changes. The publisher originally had both my name and CeCe's on the cover. Amazon picked up that version. The publisher then amended the cover and Amazon updated the cover icon. However, Amazon continued to list her as a co-author and to include a short bio on the book page. I had been led to believe that only the publisher could submit changes to Amazon. This morning, after I started this post, I went though my author page at Author Central at Amazon. From there I was able to find a link to request a change in the product description, As soon as I submitted my request, my phone rang. After a couple of minutes of beautiful music, a human came on the line. After I explained the situation, she said the change would be made within three business days. It was made within three minutes. You will find other venues which still list CeCe. My publisher's Fall catalog which is now live on the website is one example. She is actually good for sales; but I don't want buyers to be disappointed. Unless you are buying the book for a public library, you probably would not be interested in the digital version of this book. My publisher is great in marketing books to libraries and college bookstores. The 21st century consumer market is not something that the company has mastered. To them digital version does not equate to Kindle. It means reading the book on the company server. Many public and academic libraries buy rights to have their patron be able to read books of this publisher online. In your case let the buyer beware. The book is available for preorder. If you chose to order it through the publisher, you can use the following discount flyer. Shipping is probably extra. If you have Amazon Prime that includes free shipping, I'm not sure whether or not the above discount would make your total price less expensive. The book is at least 30% longer that the advanced advertising would suggest. The 136 pages was a place holder that the publisher inserted before the first draft of the manuscript had been submitted. The index of the finished book begins on page 167. I hope you enjoy and learn from it. Let me learn from your feedback. This post is a continuation of my post two days ago. Within the last week several events have occurred to flesh out our small project. This is exciting but it also will take a while to absorb this influx of new data and make sense out of it all. However, relationships are emerging among project members -- some of whom had previously appeared to be living alone on almost deserted ySNP islands. The results of an additional BIG Y kit has come back. This connected two men with at least several recent generations of documented French descent. Although they still may not have a common ancestor in genealogical times, their match appears to be within the last millennium. For one of these men whose father was adopted, this is encouragement that he is on the right track in pursuing some ySTR matches who are also of French ancestry. One member has received Sanger confirmation through ySeq that his S1026 result from NextGen sequencing was correct. Although this analogy is very crude, NextGen sequencing is the equivalent to taking images from a space satellite. On the other hand, Sanger technology would be like driving to a specific location on earth and recording an image. NextGen sequencing is much faster for scanning large areas particularly those which may be almost inaccessible or those which have coordinates which were previously inexact or even unknown. It is great for discovery. On the other hand Sanger technology can be targeted precisely to one specific location (SNP or STR) and is considered to be much more reliable. The down side it is much more expensive drive around on the surface of our genomes and record a series of images that could be stitched together to form a coherent map. It is much faster and cost effective to start with satellite images. Two men who previously had close ySTR matches with others who had previous BIG Y results have tested a single downstream SNP through Sanger technology through FTDNA and confirmed they belong in this project. These men were able to target a specific SNP that had been identified by the BIG Y results of someone with whom STR results had previously suggested a distant relationship did exist. Thus at the cost of a single SNP test, these two men were able to confirm that their SNP trail takes time down into historical times and perhaps to the beginning of the genealogical era. One project member got this week, after a wait of three and a half months, his Chromo2 results from ScotlandsDNA. The early examination of the results confirmed that he did belong to R1b-S1026. It was in fact this test that identified and named a SNP at location 19201991 as being S1026. That is where the "S" came from in the naming protocol. All of these results coming back within the same week has energized our tiny project which now only has a baker's dozen of confirmed members. However, it will take us a while to puzzle over what it all means and what our next steps should be to continue to trace our diverging trails down into genealogical time and hopefully connect with the documented genealogies of specific families. But now I must tear myself away from all this and fly to Houston today for Family Tree DNA's 10th Annual Conference on Genetic Genealogy. Don't you just hate it when your opportunities to learn more about genetic genealogy compete for your time to actually do genetic genealogy? I know, I know. I should just be grateful for my opportunities. And I am. Genetic genealogy got its start in 2000 and yDNA dominated the first decade. mtDNA entered the scene late in that decade but has two difficulties to overcome. The first is that it is a fairly blunt instrument with only 16,569 locations to differentiate among all of us. It is good for deep ancestry but has yet to demonstrate it has potential to differentiate among related individuals. Second, to date there there have not been hundreds of thousands test their complete mitochondria -- the only level at which mtDNA seems to have much genealogical value. By 2010 23andMe and FTDNA led the way into exploring the largest areas of our DNA -- the autosomes. These two pioneers were joined in this marketplace in 2012 by AncestryDNA. Now more than a million atDNA test kits have been sold by these three companies and the pace is accelerating. Autosomal DNA is great for defining close relationships -- at least when those relationships have existed within the last several few generations. 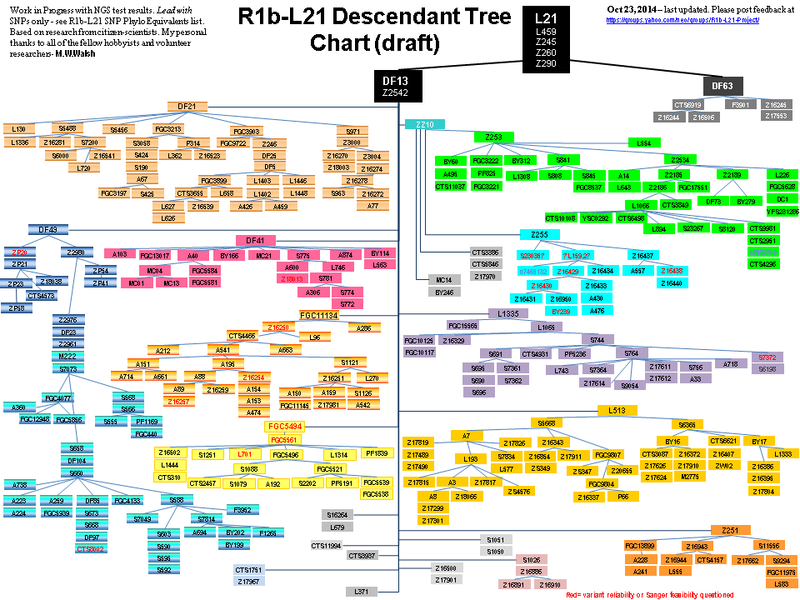 Therefore it can be very useful to genealogists. However, since it is recombined in each intergenerational transfer, it soon loses its power of discernment as we investigate backward in time. This is the hottest growth area in DNA testing for genealogy and likely will continue to be so for some time. Women are on equal footing when it comes to testing autosomes. In 2014 yDNA is making a comeback. It offers by far the longest segments of unrecombined DNA in our genomes. Therefore, it offers the best tool for looking into our deep ancestry. Although it may seem politically incorrect to say so, the less than seventeen thousand locations on our mtDNA cannot begin to be as informative as the more that fifty million locations on our yDNA. Unfortunately only men can be tested. NextGen sequencing technology is now making it possible to read SNPs at several million locations on our yDNA. This far exceeds the hundred or so ySTRs that were being sequenced by earlier technology just a couple of years ago. As a result of NextGen technology, tests like BIG Y, Full Y and Chromo2 have burst onto the scene. Although the prices of such tests are already coming down somewhat, they are still pricey compared to atDNA tests. However, the amount of data that they discover will take us a while to fully organize and analyze. Traditional genealogy emphasized starting with the present and building carefully and methodically back into the past inhabited by our ancestors. These new tests have allowed us to reverse our focus and work from prehistory down toward genealogical times. In a few cases they have already allowed us to intersect with our traditional documentary research. This trend will greatly accelerate as we get more skillful at interpreting the information written in our yDNA. The SNP tsunami that flows from these powerful new tests is allowing us to fill in gaps in charts like the one above. More importantly they are allowing us to build down toward the present. I will extend this SNP flow down to the last millennium in my next post. Back in June on the eve of Genealogy Jamboree in Burbank, I had dinner with my acquisitions editor at the publisher who has published all my books to date. She had just read and forwarded to the production editor the manuscript for NextGen Genealogy: The DNA Connection. As we parted that evening she asked, "What are your going to write next?" 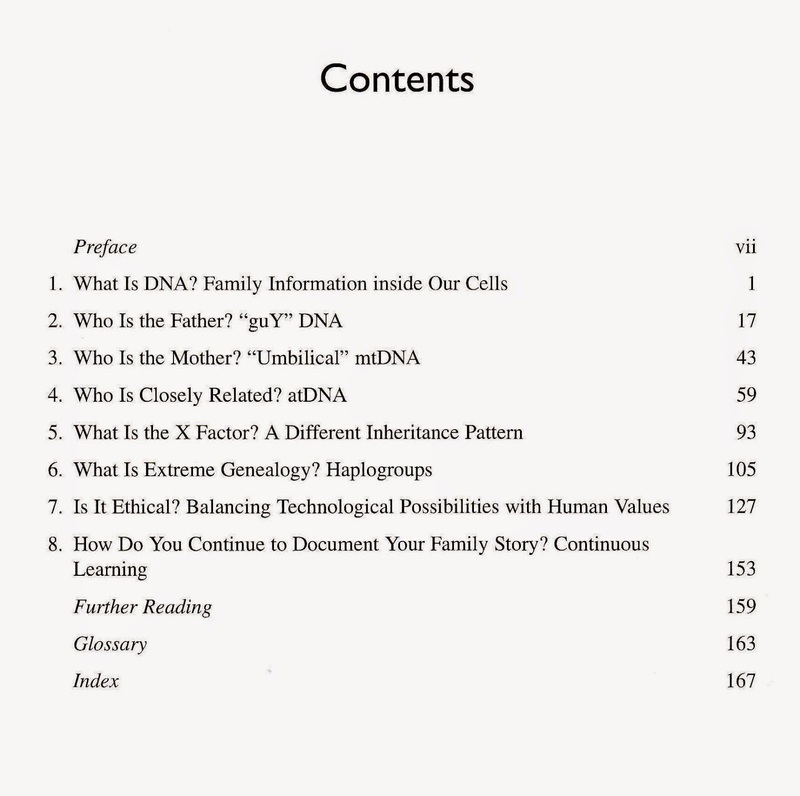 Just sent corrected page proofs & index to publisher for NextGen Genealogy: The DNA Connection. Postpartum setting in. November publication. I'm moving past the brief depression that comes with the realization that my ability to shape the final product has passed. For better or worse it is in the final stages of production. The book itself is just one of the aspects about which I now seem to be powerless. Even though Amazon has taken CeCe Moore's name off the cover, the site continues to list her as a co-author. See my earlier post about how this came to be. Once something gets into a database it seems to take a life of its own and it is next to impossible to remove/correct all locations where it resides. Now I'm still not sure what I want to do next. I'm also not sure what the appropriate venue for that effort might be. My current publisher, Libraries Unlimited, has been a very comfortable fit up until now. As long as I was writing about library topics for library workers, this was the right market niche. With Crash Course in Genealogy it was easy to maintain this tie by slanting it toward helping library workers assist family history researchers. With NextGen Genealogy that connection became more tenuous. The title was almost shifted to Praeger -- an imprint also owned by the parent company ABC-Clio. In the end this book stayed with Libraries Unlimited. If I do undertake another book, should it be with Libraries Unlimited, Praeger, some other publisher or should it be self published? The nature of the content may guide that choice. I have long had in the back of my mind that I might want to top off my trilogy with a book on the ethical issues surrounding DNA testing. This would go beyond testing for family history applications and wander into the even more emotionally charged area of testing for medical conditions. Ethics is not a new area of concern for me. In the 1970s I served on the Committee for Professional Ethics of the American Library Association. I even chaired the committee for a year. More recently, for more than a decade, I taught a short course for library workers and web designers entitled Ethics in the Information Age. However, it was only in the last three years that I came to realize that there was a significant overlap between my earlier forays into the field of professional ethics and my newer found interest in DNA testing. Chapter 7 in NextGen Genealogy is my first attempt to write about the overlap of these two fields of interest. Now that NextGen Genealogy is about to be launched, it is becoming obvious how much has changed in the last 6 months since I turned the first draft of the manuscript over to my acquisitions editor. Print publication is such a slow process in the age of instant gratification. In addition, in NextGen Genealogy, I deliberately tried to not intimidate newcomers to genetic genealogy. Is it time to start working on NextGen Genealogy 2.0: Digging Deeper Into DNA? Before making a final decision, I'll probably do what I have often done in the past. Do a little writing. Do a little teaching/lecturing. Get a feel for what works with people with whom I'm interacting. In the spring I may be teaching another class through the Osher Lifelong Learning Institute at Vanderbilt University. It wouldn't be appropriate for that audience to dive deeply into either of these topics but it may give me a chance to try some of the content. Dr. D is having a hard time trying to decide what to do when he grows up or even if he wants to grow up!